In 1917, when the United States declared war on Germany and began making preparations to send troops to France, one of its great challenges was equipping and staffing the medical corps. Volunteer efforts sprang up across the country to gather medical equipment and enlist doctors and nurses. The U.S. War Department identified locations in France which could serve as sites for base hospitals. 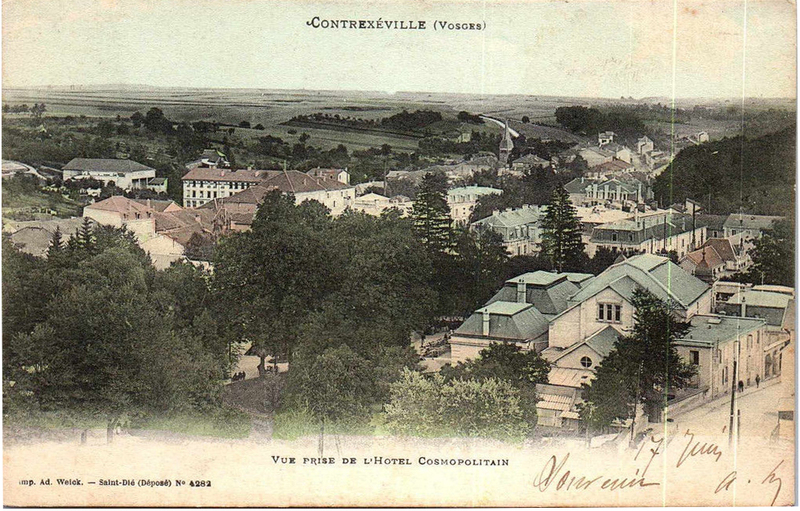 In the Vosges region (in the departement of Lorraine), the town of Contrexeville was selected for the location of two hospitals, and the nearby town of Vittel became the site of two more. Together, the hospitals of the Vittel-Contrexeville center initially had a planned capacity of 5,500 beds, but this was later expanded. Of all the base hospitals of the American Expeditionary Forces, the hospitals at Vittel-Contrexeville were the closest to the front lines just to their east. Contrexeville, celebrated throughout France for more than 100 years for its waters, is a more or less typical French town, a little more than 1,100 feet above sea level. Completely surrounded by hills, it is sheltered from high winds. Geographically, Contrexeville is on the railway which connects Nancy and Langres, 370 kilometers from Paris; five kilometers from a similar resort, Vittel, the home of Base Hospitals Nos. 36 and 23. Neufchateau is 29 kilometers to the north. Contrexeville became popular because of its Pavillon Spring, which was first brought under public notice in 1760 by Dr. Bagard, who had been physician to King Stanislas of Lorraine. Chemical analysis of its waters in 1864 brought to the attention of the French that the components of the water from Pavilion Spring were exceptional in their combination. Because of the great variety of minerals contained, medical men soon recommended courses of treatment at Contrexeville. Principal among these hotels were: La Souveraine, Cosmopolitain-Palace, de l'Etablissement, Royal, de Ia Providence, Continental, des Douze Apotres, Harmand, Martin Felix, de Paris, Martin Aine, de l'Europe, du Pare and Thiery et des Sources. Of this number all but des Douze Apotres, du Pare and de l'Europe were requisitioned by the French Government for the use of American hospitals. Of this number three were occupied temporarily by Base Hospital No. 32: the Continental for its kitchen and dining rooms; the Souveraine as barracks for the officers and the Cosmopolitain for the nurses and enlisted men's mess hall. A natural geographic division grouped the twelve buildings designed for hospital service. A park almost in the very center of the village embraced four buildings, one of which was the Etablissement Minerales, a bath house operated by the Societe des Eaux. Directly opposite was the Hotel de l'Etablissement. The Souveraine and the Casino were the other structures within the park. These buildings, with the Hotels Martin Felix, Thiery, Martin Aine, Continental and Harmand, formed the lower group. The upper group, situated on the other side of the park, comprised the Hotels Providence and annex, Paris, Royal and Cosmopolitain. The River Vair, in America hardly to be dignified by a name, passes through the center of the town, being covered by concrete construction for several hundred yards. Before the arrival of Base Hospital No. 31, Base Hospital No. 32 being first on the scene, exercised its natural option and chose the four hotels in the upper segment of the town, leaving the others, with approximately the same bed capacity, to Base Hospital No. 31. 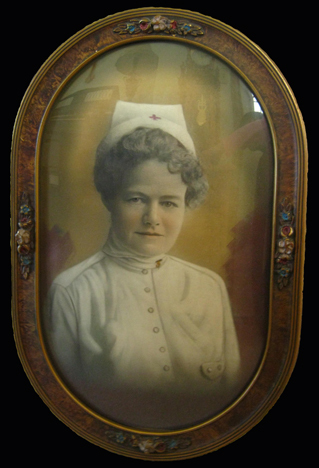 This website has been developed to gather and share some of the information I have learned while researching the history of Base Hospital 32, where my great aunt, Agnes Swift, served in the Army Nurse Corps. Wherever possible, I have identified the source of borrowed material. Any errors in this compilation are my own. I would be happy to correspond with persons interested in this topic.